The key to Right Movement is balancing productive stress with recovery – moving like a pendulum between periods of exertion and periods of rest and relaxation, with proper nutrition across the board. This dance between these two states is known as pendulation, and it creates strength in the body, supports heart rate variability and improves overall health. Without both sides of the pendulum, the productive stress of exercise can quickly become “unproductive stress.” Our recovery time must consider nutrition, hydration, quieting the mind, flexibility and stretching, breathing deeply, and a way of removing lactic acid from the body such as an epsom salts bath. Those not as predisposed to enlivening workouts might wonder – “well what about if I just relax? Isn’t that a better way to reduce stress?” The truth is that a movement practice triggers its own wonderful bio-chemical waterfall (like endorphins – Yay!) that balances out the stress hormones (like cortisol – BOO!) that are swirling through most of our bodies on a regular basis. But you don’t have to lift weights if that’s not your thing – or become a cardio fiend if it doesn’t call to you. The key is discovering your Right Movement – a practice that feels fun and challenging and gets the heart pumping and the muscles working in a way that is right for you. This might be walking, jogging outside or at the gym, taking a dance class, taking yoga classes, working with a trainer, dancing around your living room to an upbeat playlist for 15 minutes. Whatever it is, as Nike says, Just Do It! The body needs proper nutrition to fuel productive workouts and to recover and regenerate after them. Crowd out processed and packaged foods with an abundance of fresh produce and a moderate amount of whole grains/legumes. Limit meat. Reduce and maybe eventually remove stimulants/drugs. Shoot for three balanced meals and snacks to support recovery. Nutritional choices account for approximately 60% of unproductive stress in the human body. By eating consistent meals with high quality nutrition, the body no longer responds by holding onto excess weight. A diet that removes foods that cause unproductive stress in the human body (ironically they are also the foods we crave when stressed) and stimulants (also consumed as a result of stress) creates optimal conditions in the physical body. Make a recovery plan and follow it: stretching, hydration, nutrition, relaxation, sleep. Alternate your movement practices to allow for recover – for example cycle one day, take a restorative yoga class the next. It’s not just the big muscles that need stretching and recovery either, it’s also the fascia and nervous system which are addressed by restorative, yin and yoga therapeutics. Book your favorite masseuse… every week! Take epsom salts baths. Breathe deeply. Head into nature… every day! Surround yourself by flowers, your favorite essential oils, candles, soothing and/or energizing music. Practice meditation, even just 5 minutes a day. One of the incredible things about yoga practice, is that it has benefits on so many levels: physical, spiritual and emotional. Knowing not just the biological impact of the poses, but also their symbolic influence, can really aid in getting ALL the benefits. Developing abdominal strength isn’t only relegated to crunches and ab work on the floor. So when you wake up feeling low, or just want to boost the confidence you already have, try the following standing core exercises. Setting aside five minutes to practice these three asanas throughout your day may leave you with more than just a toned midsection. True to its name, this pose is fierce! Particularly when you hold the posture for several minutes. The action of engaging the abs by drawing the navel to the spine and lifting up on the pelvic floor strengthens the posture and tones your body! For a detailed description, check out this article at Yoga Journal, or this explanation at YogaSimple. We recommend holding the posture for 5 deep breaths. Repeat the posture three times, each time sinking a little bit deeper into your chair! The mantra “I’m stronger than I think I am” can be a wonderful support for this asana. This posture looks easy, but with several deep breaths, the abdominal obliques will be firing! With each inhalation, find length in the spine. With each exhalation, extend a little bit deeper into the form. Practice this posture on both sides for 5 deep inhalations and exhalations through the nose. Repeat three times. The name is a mouthful, but the posture can be incredibly rewarding, as it requires you to engage your lower abdominal muscles and the bandhas (particularly mula bandha and uddiyana bandha… more on these helpful little tricks in a forthcoming article!). Try this posture with your hands on your hips and your leg extended in front of you with your foot flexed, directing energy through the standing foot and the foot that is lifted. Practice this posture on each side for five deep breaths, three reps on both sides. Your leg can remain bent if straightening the leg is not possible. Over time you can explore more advanced options such as clasping the big toe and extending the leg straight out in front, out to the side, and even twisting. Here’s a great video on the whole standing sequence, from moderate to advanced versions. If you’re more drawn to a restorative practice, check out their restorative sequence for holiday survival! And if belly health is your top priority, they’ve got a more active sequence to support digestion. Check out the video below that explains and demonstrates this easy movement. We recommend doing this for five minutes a day, several times a week. The adjective “humble” comes from latin roots humilis, which can be translated as “from the earth” or “grounded.” Defined as “a modest or low view of one’s importance,” humility or “being humble” can easily be associated with the emotions of submission or passivity. However, the asana, Humble Warrior, invites forth a new, more expansive definition of being humble. Each stage of entering the posture teaches us something about embodied humility. – We first find stability and presence with solid footing and a rooted foundation. – Then we balance our hips as we send our front knee out directly over the ankle. – Our hips are strong emotional centers in our bodies and, by balancing and opening our hips in this posture, we are also releasing stuck emotional energy. – Lifting and opening the heart, we clasp our hands behind us, melting our shoulder blades down our backs and interlacing the fingers. – The next action is to draw the navel toward the spine, tucking and rounding, engaging the core. – At the core resides an energy center called the Manipura Chakra, which is associated with self-esteem and confidence. A strong sense of self helps this energy center stay vital and healthy. Likewise, a healthy sense of self precedes humility. 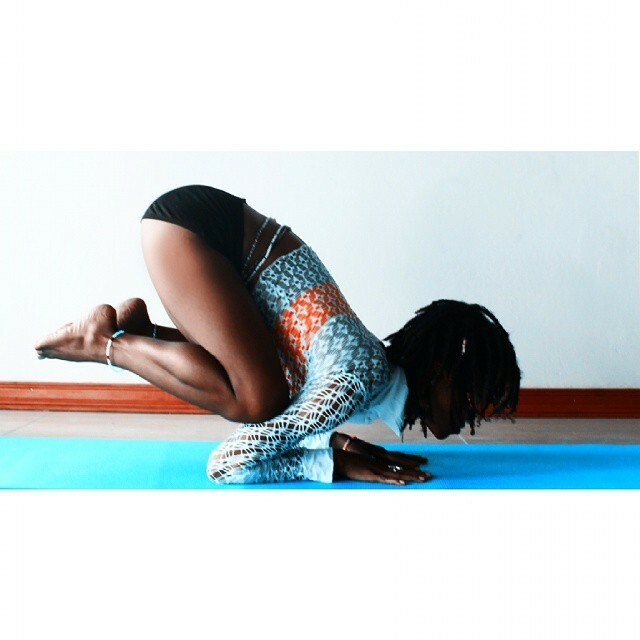 – After we lift the heart and engage the core, we bow the head toward the inside of the front foot, releasing the head and the neck, while keeping our hips and shoulders aligned. Here’s one way to look at the subtleties of the posture: Finding stability and strength, we can stand in the present moment on our own two feet. By aligning and opening our hips, we balance and let go of stuck emotional energy, generating inner peace. By releasing our shoulders (or “should-ers”) down our back with our clasp, we open and lift the heart. Engaging our strong core, we express a healthy sense of self. And, finally, surrendering to higher power with a deep bow toward the floor, we let go of pride. Enjoy this article? #GoDeeper and learn the ins and outs of the form with Five Pillar’s article: The Other Warriors: Reverse and Humble. Spring has sprung and, as the wind blows in warmer weather and the sun begins to shine, we literally begin to spring into action. Despite the days being longer, so many of us still feel like we are short on time. Taking time to practice yoga becomes even more important as our calendars begin to overflow with activity and plans. This is, of course, a perfect time to prioritize regular yoga classes. On the days when yoga class just won’t fit into your schedule, set aside a couple minutes to listen to our May playlist and move through your favorite yoga asanas. During yoga class, the teacher’s voice and their playlist can help you to go deep into your practice. This May Mantra Playlist offers a gentle rhythm to support you in your personal practice. So when you need a little extra calm in your life, slow down and turn on these tunes, featuring three of our fav yoga artists. Listen on your commute to work, play these mantras as you practice at home, or allow these healing sounds to help you let down as you drift off to sleep at the end of the day. You’ll find this playlist helps you to breathe deeply, with a steady, gentle rhythm designed to invoke a sense of inner peace… so allow your breath to be deep and rhythmic… and just follow the guidance of your own body. Go ahead…. #GoDeep and create some calm!